WHERE TO YELLOW JACKETS NEST? WHY ARE YELLOW JACKETS SUCH A PROBLEM? WHAT WILL ATTRACT YELLOW JACKETS? FOR GROUND NESTING YELLOW JACKETS, GET OUT THE DUST! WHAT IF YOU CANNOT SEE THEIR HOLE IN THE GROUND? 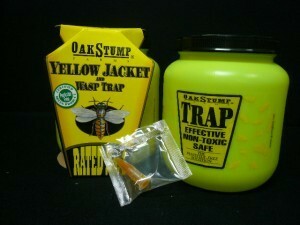 WHAT ABOUT YELLOW JACKET TRAPS? 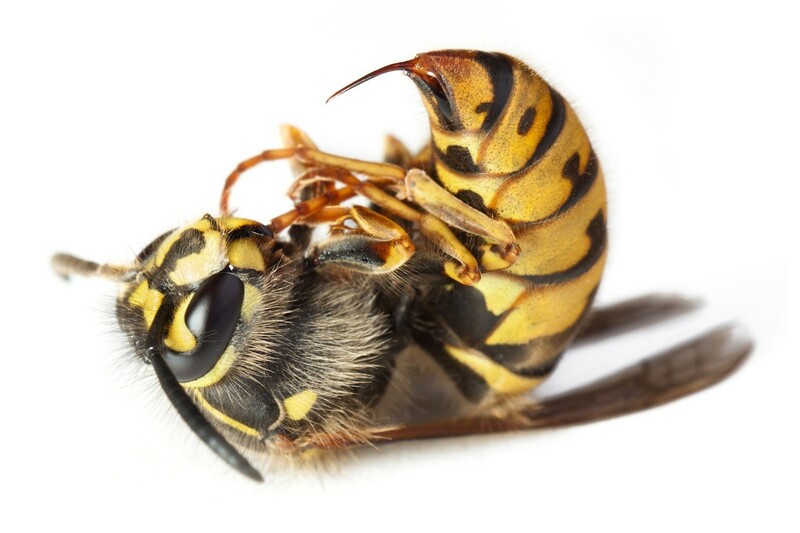 Yellow Jackets are small, yellow and black wasps which are a constant nuisance to people during the summer and fall. At this time their nests will peak and conflict with man will surely arise. Yellow Jackets routinely send people to the hospital because they’re quick to sting and will do so in great numbers. Anaphylactic shock is commonly caused by this pest so be aware of local nests so you can keep a safe distance away. This article will detail basic yellow jacket biology and then offer details on how to control a local nest using the best products available for the job. Yellow jackets will typically nest in the ground, under stumps, in the nook of a tree or in the wall underneath the siding of most any structure. In fact they seem to love empty, shady and well protected voids. On the side of a home, their nests are easy to locate because you’ll see them flying in and out all day long. In the yard, the same behavior is easy to discover when they nest in a tree. But in the ground it can be more difficult to locate their main entrance. For this reason its generally ground nests which conflict with man the most. This happens when unsuspecting hikers walk over a nest or one is agitated out in the yard or garden. The general rule is anything goes once you get within 10 feet of their home. Yellow Jackets are a major problem for many reasons. Around the home they will routinely try to feed on picnic food like meat or salad. They love fruit and will forage on garden crops as well as any kind of sweet drink brought outside. Yellow jackets love pet food, pool water, hummingbird feeders and even sweat! 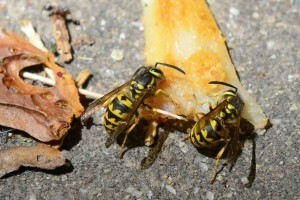 Nothing is more disgusting or potentially hazardous then biting a yellow jacket feeding on your hamburger or hot dog. Every spring, overwintering queens will get active as summer arrives. They’ll find a new nest location and lay eggs. This first brood of eggs will be the foundation of a new nest and if they survive in early summer, her kingdom will thrive. Over the next 1-2 months, she’ll continue to produce eggs as will her first offspring and by mid summer, her nest will reach triple digits. At this time foraging scouts will become noticeable as they arrogantly try to grab any high protein or sugar based food. Its at this time conflict with man will arise as they will routinely fly onto our food and drink. Gardens will be ravaged and even the sweat on your skin can become a target. Basically the population will stop at nothing to feed their young larvae. And though this sounds noble, the adults have self motivated intentions. They get a sugary food by product from their young larva in exchange for the protein they provide. Yellow jackets are no doubt one of the more aggressive wasp species around. If threatened, they will sting. In fact, yellow jackets will sting more readily then most any other wasp. And since they can sting so over and over without loosing their stinger, it’s best not to irritate them. Unfortunately a simple reaction to one buzzing around your head, arm or leg can be enough to irritate it so be careful if they’re routinely attracted to you. Since yellow jackets use both vision and odor to find food, people will many times become the target of their focus. This happens for many reasons. People regularly sweat which yellow jackets love. They will readily seek this salty moisture where they can find it and during warm hot dry spells, people become a prime target. But they also love the sweet drinks we consume outside when active as well as the food we carry afield. For this reason, runners, hikers, bikers and most any summertime activity outside might draw the attention of local yellow jackets. In general, high protein, sugary and fatty foods will attract yellow jackets. Furthermore, colognes, per-spirants and other scents people commonly wear can contribute to yellow jackets finding us attractive as well. And since they use vision to tract food, certain colors will can catch their eye. At this time there is no real pattern for this behavior but its very clear that bright colors during certain times of the year will get their attention. If you are someone that tends to naturally attract yellow jackets, there are two products you can use to help minimize this behavior. If it’s your sweat and general body odor they find attractive, use either DEET LOTION or DEET AEROSOL on exposed skin areas. Common areas they’ll target will be your arms, legs, neck and facial regions. Deet will help keep yellow jackets away and usually one treatment in the morning will protect you all day long. Now if it’s your wardrobe they are more attracted to, apply PERMETHRIN AEROSOL to all hats, shirts, shoes and pants before going outside. This product has no odor and it will repel mosquitoes, ticks and chiggers too. For the occasional yellow jacket in the home or on the deck or patio, a HAND HELD ZAPPER is fun to use and highly effective. It runs on double A batteries but will produce a shock strong enough to kill any wasp or other large insect and its easy to use. There are several ways to treat an active yellow jacket nest but the best option will depend on where the nest is located. The sections below will explain how to treat nests in the ground, nests in the side of a home or structure, nests in a tree and nests located on another property. Yellow Jacket nests in the ground are best eliminated by dusting with DRIONE DUST. This material is fast acting and essentially dehydrates insects by cutting through their exoskeleton. Use a HAND DUSTER to make the application and be sure to puff a good 2-3 oz of dust into the nest. This should only take 5-10 seconds and should be done close to dark. This insures all members will be back at the nest and your risk of getting stung will be low to zero. Drione is very “smoky” and will readily penetrate all the caverns, curves and voids found in any yellow jacket nest. The following video shows how easy it is to dust a nest and how quickly you’ll see results. When done properly, the nest should be dead within 60 minutes and all activity will cease within 1-2 days. The 6 oz jug of Drione is enough to treat one nest; get the 1 lb jar if you suspect you have more than one nest active. You’ll need a good HAND DUSTER to apply the Drione. This one can hold 2-3 of dust per fill up which is usually the right amount needed to get the job done. In some cases it can be hard to see the exact entrance and exit hole being used. This can happen when the holes are obstructed by leaf litter, plant growth or some other natural part of the landscape. But as long as you see an area where they’re landing, you’ll be able to successfully treat. So for this type of a problem, you’ll need a special “non repellent” spray known as OPTIGARD. This product is undetectable by insects so they won’t know anything is being applied to the area. You’ll need to spray at least 1/2 gallon over the area every night around dusk for at least 3 nights and since this product takes a few days to work, don’t expect quick results. But after 3-4 days of them moving over the chemical they will be picking up the active and transferring it to all the members of their colony. So by the time it starts to work, it will be too late for them and the entire nest will be killed. Mix 1/2 oz of Optigard per gallon of water and apply at least 1/2 gallon every evening, close to dark, by spraying it over the area heavy. Limit the area to no more than a 5 foot by 5 foot square. Since the exact location of their nest is unclear, you’ll want to saturate this area good. By the 3-4 day after the first treatment, you should notice a big drop off in their activity and within 5-7 days, the nest will be dead. If you see yellow jackets or any other bee or wasp entering your home by going under the siding, DO NOT SPRAY WASP FREEZE OR ANY OTHER TRADITIONAL SPRAY INTO THE HOLE!! This would be a HUGE MISTAKE. Basically any traditional product will not penetrate the nest deep enough so even though you’ll kill some, its more likely the nest will continue to thrive and worse yet, end up creating a new hole to use which often times leads to inside the home. This would be very bad and for obvious reasons, needs to be avoided. 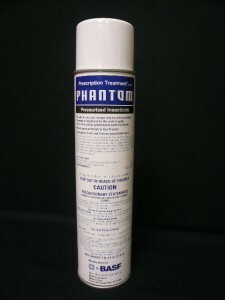 So for any nest on the home, the best active to use for direct treating is PHANTOM AEROSOL. This product is known as a “non repellent” which means it won’t be noticed by the nesting yellow jackets. Even as you spray the nest they won’t care and in fact won’t be affected for days. But after 2-3 days, you’ll begin to notice the nest is getting less and less active and by 5-7 days, it will be completely dead with no activity. To treat the nest, all you need to do is spray the opening for 10 seconds a night. Do this close to dark and make sure to spray continuously and once you’ve applied 10 seconds worth of material, turn and leave the area quickly. In most cases they will be so surprised they won’t be moving much until you’ve left the area. If the nest is located up high, use an AEROSOL POLE to get the Phantom within range of the entrance. This kit comes with four 4′ extensions so its total length is around 18 feet. So for the average person they’ll be able to reach up close to 25 feet with arms extended. And if the nest is higher than 20-25 feet, you can add several 4 FOOT DUSTICK EXTENSIONS to reach 30 feet up or more. Now if you’re lucky and there is a yellow jacket nest in the nook of a tree away from the house, you might be able to successfully treat it using this super strong HORNET AND WASP KILLER. This formulation is quite strong and can shoot a pin stream up to 20 feet making it safe enough to use for tree nests. But you must be able to deliver the spray directly into the gap where they’re entering. This can be tricky and if you’re unsuccessful, the nest will continue to be active. In general, if you still see activity two days after you spray, it means you’ll have to use the liquid option listed below. Now if the nest is too high to reach when spraying from the ground, consider climbing a ladder or getting the AEROSOL POLE listed above. It will let you reach up well over 20 feet so you can deliver the Hornet Freeze exactly where it needs to be sprayed. Alternatively, you can use another type of spray which is ideal for when you can’t spray the nest entrance directly. So if the nest is on a section of the tree where you can’t direct the spray where it needs to go or if you have yellow jackets landing on a tree girdling it or eating the foliage, treat all surfaces with OPTIGARD. This liquid concentrate is like Phantom in that its non-repellent. This means the yellow jackets won’t notice the application and will readily walk over treated surfaces. Like Phantom, they’ll unknowingly be bringing the chemical into their nest and “sharing” it with other members of their colony. Within 3-5 days you’ll start to see the nest activity slowing and within a week, it will be dead. To successfully use Optigard, mix up 1/2 oz per gallon of water and use 1/2 gallon of spray every evening by spraying it directly on their entrance/exit hole. Do this every night for at least 3 nights and for most nests, this will be too much for them to handle with results starting to be noticed by the 3rd or 4th day. One of the most frustrating problems with yellow jackets is trying to deal with an ongoing conflict when the nest is located off your property. In this case, the jackets are usually found swarming your garden, your drink or your food when you go outside and try to enjoy a picnic or nice relaxing evening on the deck. Yellow jackets will routinely track food for acres so if their nest is located on another property, how can you treat it? Fortunately there is a way. The key for this process is the use a unique pesticide known as a micro-encapsulate. Basically this product encases the active ingredient in tiny microscopic capsules which make the product shielded so it can time release. When used as a spray around the home, these capsules slowly release chemical and over time, renew the active so you can achieve extended residuals. This means you don’t have to spray nearly as much; the treatment can last 3 months or more. Now at some point in time back in the 90’s, someone experimented with these formulations and discovered the encapsulates could be mixed with food attractants and in turn, become “flavored”. Basically the pesticide capsules will absorb the food flavor and when fed to the target pests, the capsules will eventually “hatch” and release inside the pests stomach. Like the non repellent sprays, this process takes several days to achieve success. But once yellow jackets start feeding on the bait, they will bring it back to their nest and “share” it with all their young and other nest members thus sealing their fate. To employ this process, you’ll need ONSLAUGHT. You’ll also need a good food attractant and our protein based FISH PASTE is generally a great option for any meat seeking yellow jacket. But if you have “sugar” feeding jackets, go with our super sweet LOGANBERRY PASTE. It uses highly complex sugar carbohydrates and has proven equally effective for when the jackets are targeting fruit or sugar drinks. To create the right bait, you’ll need 1 oz of Onslaught mixed with 8 oz of food lure. Be sure to stir the mixture for at least 30 seconds to insure uniform distribution. For most yellow jacket activity, our protein based fish paste will be readily accepted. But if the yellow jackets around your home are targeting something sugar based, go with our Loganberry paste. Of course, having some of both is your best option. Yellow jackets will vary their diet throughout the summer and fall so having some of both pretty much insures one will be readily accepted. To avoid having non target animals like cats or dogs eating your bait placements, use BAIT GUARDS to protect the mixture. These stations use a special key to keep them locked and inside contain a couple of trays which will hold the bait mixture. The front panel of the station has small vents large enough to let yellow jackets enter so they’ll have access to the bait. Each station has holes through the back side so you mount it on a tree or the side of your home using a nail or screw. Remember, the more placements you make around your property the better so we suggest getting a few extra stations. You only need one key to open them since its “universal” and will work on any station. This method of control is very effective in areas of the country where yellow jackets are a constant nuisance at picnics and barbecues. 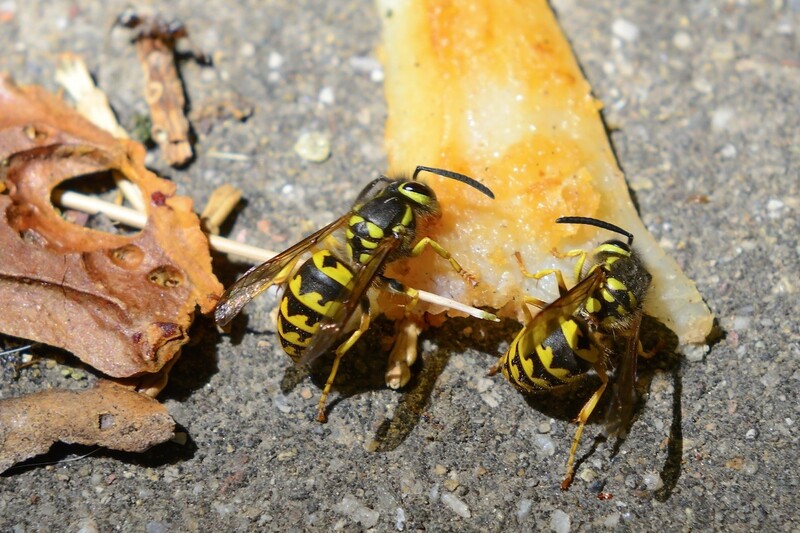 If you have a problem with these wasps appearing every time you grill hot dogs or hamburgers, than set out bait around your property for quick control. Since yellow jackets can travel great distances and will do so when searching for food, the nest could be acre’s away making a direct treatment impossible. Don’t waste time with yellow jacket traps. If you have significant yellow jacket activity, they’ll quickly replace the workers and scouts your traps keep so the problem will never end. Remember there can be many nests in any given area and that activity at your bait stations could go on for several weeks or new activity can develop a week or two after one nest is killed. Usually any nest that finds the offering will feed for 2-5 days and then stop. But once they stop its just a matter of time before another nest finds your offering and starts to feed so keep all the bait new and fresh by changing it every 2 weeks in season. In general, we don’t recommend using yellow jacket traps. The main reason is that they’ll just lure yellow jackets to your property and though they will catch some, you’ll still see and experience conflict. And since the active nest will just keep replacing the scouts as fast as you trap them, the never ending stream of jackets coming to your property won’t decrease. But for mild problems in regions with limited nests, placing traps around the border of your property, away from people, can help. If set up efficiently, this configuration can catch them before they find the food you’re bringing outside and in some cases, reduce the amount enough. 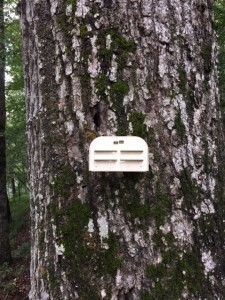 For this approach, our standard JUMBO YELLOW JACKET TRAP.is a good choice. Its quite large and can hold hundreds of jackets. 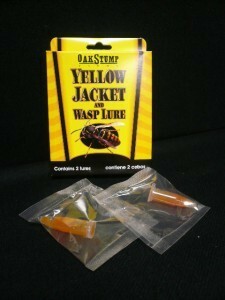 It comes with one YELLOW JACKET LURE which will need to be replaced once a month. Replacement lures should be used every 14-28 days under normal conditions; more frequently if the trap is filling up before two weeks. If you want a more “contempory”, cosmetic design, go with the GLASS YELLOW JACKET TRAP. This is a bit smaller but works well and is much more decorative. 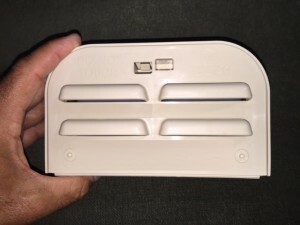 Like the Jumbo trap, each trap comes with a single lure which needs to be replaced every 14-28 days. I have a large yellow jackets nest inside the walls of my hot tub/spa. It’s a small hot tub (only fits 4 people). I really need to be able to use it again because I broke my back in a 3 story fall and it’s the only thing that gives me relief. I read through all of your solutions but couldn’t figure out which one would be best for my needs…also I should add I stepped in a yellow jackets nests when I was about 15 years old and was stung about 300 times…naturally I ran and for some reason when I got to a large clearing they finally left me alone but by that time I was already on my knees crawling and promptly pass out. I spent days and days in the hospital…it was actually interesting that they came after me because we had 2 dogs and about 8 other people standing right next to me when I stepped on the nest. Everyone else got no more than 5 stings…2 people didn’t get any…but they sure did zero in on me. Do I have a point to this story…yep, I’m scared to death of them…so would you please help me find an answer to getting rid of them please. Based on your history, my first suggestion is that you should consider hiring a pest control service to take care of the nest for you. This would obviously remove any anxiety you may be feeling. Plus, it will allow you to get the job done quickly and eliminate the chance of you getting stung. But if you are inclined to do the treatment yourself or have someone that can do the work for you, here’s what I suggest. For now, see if these yellow jackets are willing to feed on some jelly or fish flavored cat food. If so, you can use the bait method we have listed in our article above. Baiting for yellow jackets is easy as long as you know they’re willing to eat your offering. So if you can get them to eat either jelly (grape flavor should work) or fish flavored cat food, you’re in business. Now once you know they’ll consume either food offer, you’ll need to get some Onslaught along with either our Salmon Paste or Loganberry Paste depending on which of the two flavored food baits they preferred. If they liked the grape jelly, get the Loganberry paste. If they liked the cat food, get the Salmon paste. Once you receive your order, you’ll be ready to treat. So for the treatment, the paste will become the attractant you’ll use for baiting the yellow jackets and this will be placed in our Bait Guard along with a small amount of the Onslaught. Next, you’ll place the bait stations where you were able to last get the yellow jackets to feed on your first bait offering. In theory, they should readily accept the new offering and in doing so, kill themselves within 3-6 days of feeding. I have yellow jackets that have created a nest in my trailer which is loaded with branches and brush. What is the best way to kill them in this situation? Thanks. If you see the nest, treating it directly with some Cypermethrin and Spreader Sticker would be quick and effective. If you can’t see the nest, bait them. This will first involve identifying a food they like to eat. This food will be something sweet or something protein based. The Salmon Paste and Loganberry Paste we show above will work if you don’t know what to try. Once you find which of the two they prefer, set up some Bait Guards with the paste and Onslaught mixed in. Place the bait guards close to the nest and once they start feeding, the nest will die in a few days. I have a nest of yellow jackets next to my front door that appear to be in the light fixture. I’ve already been stung a few times. What would be the best product to get rid of them? Thank you. So how then can you treat it effectively and avoid making it a mess? There are two ways. The first is to treat it from an inside the home. This might sound odd but if can locate the section of wall directly opposite the light fixture and it’s an open area, you’re in business. I say this because if that section of wall is open and visible, you should be able to get close to it and put your ear up to the wall and listen for the yellow jackets. If the nest is close to the light fixture you should be able to hear some buzzing and with a little detective work, identify where they’re traveling and where the nest is centered. Now don’t think the nest will automatically be directly behind the light fixture. In fact I’ve seen where they’ll come in and the nest is right there, directly behind the fixture. But I’ve also see where they’re coming in and then traveling 10-20 feet sideways with the nest being located on the other side of the home! Following the treatment directions above should lead to a quick kill with little hazard to you (or whomever does the treatment). We have hummingbird feeders which attract yellow jackets. We have tried several types of traps that have worked a little but we have found several nests around the house the hard way and have destroyed those colonies. We need to find something to destroy their colonies. We live in a wooded area and try to keep the weeds cut about 200 ft around the house but we are getting into their nests. Please let us know what will work best in our situation. 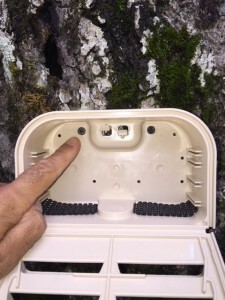 No doubt the baiting method listed above will handle your problem. It’s easy, will only target yellow jackets and will kill any nests that have scouts foraging to your feeders. This way you won’t have to worry about where the nests are located since the feeding scouts will end up causing the demise of their colonies. To use this method, you’ll need to get some of the Loganberry and Salmon Paste, Bait Guards and Onslaught. First, set out a little bit of each paste in a small plastic cup close to the hummingbird feeders. Don’t add any Onslaught to this placement; this is only a “test” placement to learn which of the two flavors the yellow jackets want right now. So if they want both flavors great but usually they’ll target one over the other. Once you find if they want one or the other, use the flavor they’re targeting and set out 2-3 Bait Guards around the property. As explained above, feeding yellow jackets will share the food with other members of their colony and within a week, the entire community will die. I have a yellow jacket nest under the vinyl siding of my house at the bottom near ground. My dog was stung multiple times. I have two dogs total and was wondering what you recommend. As explained above in our article, if you attempt to treat the nest while standing on the outside of the house, there is a good chance you’ll miss it and in the end, chase it deeper into a void. This can cause all kinds of problems and should be avoided. Also explained above is that the best way to get these nests is from inside the home injecting a dust or aerosol through the wall void. This way even if you don’t get it precisely, you won’t chase them into the living space but instead, out of the home. And the products to use for this would be either the Dforce or Drione Dust. I have yellow jackets in my siding (a crack near the decking). Most come and go from this hole. There is another spot about 10 feet below it where I see a few coming and going. I bought your duster and powder. I also have a bee suit. I saw where someone dusted and closed the holes with caulking (in the Internet). He did it during the day. When is the best time to apply the dust and how should I apply it? Can I expect the yellow jackets to attack even at night during or after the application? Any pointers would be appreciated; particularly on how not to get stung, but kill the nest. Definitely treat the nest in the evening close to dusk. This insures most if not all of the occupants will be inside the nest. Treating during the day means there will traffic in and out of the colony. This also means some will be en route to the nest and when they arrive to find you treating, they will no doubt get mad and aggressive. This number could become significant but impossible to say specifically since there is no way to tell how many will be out and about when you decide to treat. But treating in the evening reduces this risk quite a lot since they mostly stay at home once it gets dark. As for “how to apply it”? This question confuses me because you state you have the duster and the Drione so the “how” is by using the Duster filled with Drione. 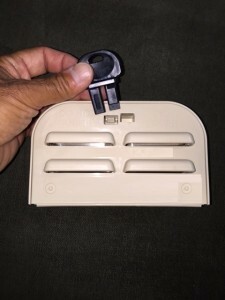 For more info on how to use the Duster, we have videos on most every model we sell so look at the bottom of the following pages if you acquired a Crusader or Centrobulb Duster; the videos on each product page explain how to use each duster properly so you can be most effective when treating. Lastly, here is one big tip. Can you “hear” the nest from inside the home? If so, you might consider treating from inside. This will many times be highly effective – especially when nests are deep in voids so they are basically inside the home just behind sheetrock or paneling. In such scenarios, simply drilling small 1/4 holes through the wall and puffing the dust into the void can prove to be a quick and effective way to proceed. The other big advantage of treating from inside is that you can many times avoid all conflict with the yellow jackets because there is a wall separating you and their nest. But if you think the nest is only under the siding, try to imagine where under the siding. Remember, they like using any “open” space or gap so do you think they’re in the space between the siding and the outside decking? Or are they maybe behind the decking and inside the stud space filled with insulation? My point is once they get deep into the wall, it can be tough to reach the nest using just 1-2 entry holes. Personally I like to treat a large area by drilling 4-8 holes where I “think” the nest may be located. Only then do I feel I’m able to get the entire nest covered in dust which in turn will insure success. Oh, and of course, the dust to use is no doubt the Drione so be sure that’s what you acquired for the job. We have outdoor teak furniture in one residence and ipe (ee’-pay) furniture and decking at another. In both locations, yellow jackets land on and nibble the wood, leaving minuscule troughs and discoloration. Where we have the ipe, they seem to be using what they chew for nest-building purposes, and we have had an exterminator destroy the nest. However, our teak furniture is outside our condo, and there is no nest in sight. I suspect they are traveling from a nest elsewhere to scour for nesting material and have hit the motherlode with our numerous chairs and tables. Only thing I have been able to find online regarding this problem is treating the teak with a combination of 1/3 citronella, 1/3 eucalyptus oil and 1/3 menthol. I contacted the retailer of our teak furniture and she indicated she knew of the problem, but the only thing she offered is that there is a solution available in England that prevents the problem, but it is illegal in the U.S.
Are you aware of any legal treatments other than the eucalyptus/menthol/citronella mixture that will keep the destructive little buggers away? This is an easy one. I happen to have a similar problem and will share with you my “fix”. In my yard, both yellow jackets and european hornets were once doing the same thing to my redwood deck. Initially I was using Viper to repel them. And it worked okay; treatments would last a couple of weeks and they stayed clear of where I sprayed because they don’t like the chemical. But as it wore away, they would return and with it, the relentless damage. In the end I knew I needed to get their nests treated and that would be the best way to solve the problem. At that point I tried using two products and amazingly, they worked great. These products are unique in that they don’t kill on contact nor are they detectable by insects. This means target pests will walk over the treatment and unknowingly pick some up which in turn they will bring back to their nest and “transfer” to other members of their colony. Originally created for ants and termites, I found they work for any “social” pest as well. So after 2-3 days of doing foraging on the treatment, they will effectively have transferred enough of the product to kill their nest. The beauty of this process is that by getting the nest there is a lot less chance of any returning. At least for that season. I’ve learned I usually have to do at least one treatment per year now to keep them at bay but it works like a charm. 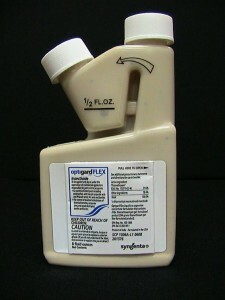 But if you have large areas to treat, the Optigard Flex might be the smarter option. It too is odorless but as a concentrate you’ll mix with water and it will be able to cover a much larger area at a fraction of the cost. You can spray it or paint it on too. I have yellow jackets building nests in the ceiling over my front porch. It is a large wrap around porch whit a plastic ceiling that drops out, thus there are many gaps that allow them to get in above the drop ceiling. Unfortunately I cannot seal that. I have dropped the ceiling out recently and found several small nests. It is late winter, so I just removed them. In the past a few have entered the house., although I can’t find the crack in the wall. I want to keep these nests out… What can I do to prevent this from reoccurring every year? This is an easy one. Get some Drione Dust and a Hand Duster. Simply “puff” the dust into the cracks. It will only take 2-3 squeezes of dust every 12″ and the Drione will float up and into the void thus covering all the hidden areas. Once these spaces are dusted, yellow jackets (or any other pest) won’t use it for nesting 6-12 months. Now if the ceiling is hard to reach or if you don’t feel like using a ladder to get the work done, we have dusters that can reach up quite high. Here are links to the Drione and a few dusters. Now if you get this space dusted once a year, you won’t have yellow jackets or any other pest using it for nesting. In fact, going around the home and dusting any small crack or crevice would be a wise move too. Basically apply to some to soffits, window frames, behind shutters, door frames, light fixtures, etc. Drione is great stuff and when used with any of our dusters, you can control a wide range of pests including yellow jackets. Here are some videos that go over Drione and the Duster options in greater detail.